Hannah Genders is inspired by an Oriental garden in Yorkshire. Inspiration can come from all sorts of places and it’s always good to view things from outside the comfort zone that you normally work in. I had the opportunity to do just this recently by travelling up to Yorkshire to visit a garden built using Zen principles in the stunning countryside outside Harrogate. The style is completely different from any gardens I design and it was fascinating for me to look at his ideas and begin to understand the principles behind them. The Zen or Japanese style of gardening has important structural elements; the first is always the rocks. These are usually very large and exquisitely placed for maximum effect, mainly in groups of three but sometimes in a group of five or seven. It can take hours or even days to place these rocks correctly, to make them sit comfortably in their surroundings and look like they’ve always been there. The large upright rocks are buried with around one third in the ground so they don’t move and also give a feeling of permanence to the garden. This in itself is quite a feat when you see the size of the rocks Bahaa uses, and I have it on good authority that he is a perfectionist when placing rocks at the start of any project he is working on. The rocks must present their most attractive side and any veining or markings must run in harmony with the rock placement – adjoining rocks in the group can run horizontally but again the space between the rocks must be in perfect balance. These rocks then form the structure around which the whole of the rest of the garden sits. 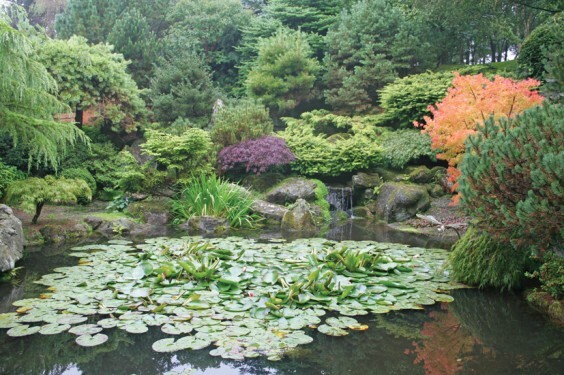 The next major element in Japanese gardens is water, either a pool or stream, although sometimes water is represented with gravel. The pools are for reflection and meditation; the streams are made as natural as possible and said to represent the mountain streams in Japan. Having done a few water features in gardens myself, I know how difficult it is to get this right and Bahaa’s garden shows this to perfection. The waterfall into the main pool which is viewed from the house took him months to get right, moving rocks to allow the water to flow in perfect symmetry down into the pool and look completely natural – amazingly, the whole site was just a grass bank when he started. Even more amazing, though, is the fact that this waterfall hides a second, secret pool. Following round on some stepping stones at the side of the main pool, you come to a grotto set in large rocks with a tunnel to squeeze through – and, astonishingly, another pool in the secret area beyond. This was my favourite space in the garden. One of the ideas behind Zen gardening, taught as long ago as the 11th century, was that in wandering through the garden you became unaware of the hectic world you had left behind. This was certainly true of this lovely second pool in Bahaa’s garden. Carefully-placed sculptures just added to the experience of being in another world. The planting in this and other gardens Bahaa has completed is very formal, clipped and controlled. Sometimes the plants spill on to the rocks like water, sometimes they are clipped to look like rocks themselves, but careful and accurate pruning is the key. The colour of the garden is predominately green and very soothing; most of the trees are evergreens, grown for their shape and habit to complement the rocks. Acers will bring some bright, fiery colours in the autumn but there are no cottage garden perennials here and very few flowers. The shrubs are used for shape and also for texture – the limited colour palette makes you look at the leaf form and structure in more detail. I have to say I loved the garden and actually the design sat very comfortably in the Yorkshire moorland, probably largely due to Bahaa using local stone in his projects. I understand that he will stop if he sees a beautiful rock in a field and then try and find out whose it is and if it is for sale. This was an inspiring experience all round for me, and it has made me look at the way I design and wonder if I can improve on the structural elements of my gardens.